Pontius Pilate was the appointed governor over the southern portion of Israel during the time of Jesus. While declaring Jesus innocent 7 times, he still gave the release for his execution. If Larry King could have interviewed him a few years later, perhaps it would have sounded like this. Interviewer: My guest tonight is Pontius Pilate—the governor of Judah during the time of Christ. Pilate, tell us about yourself and your terms of service in the land of the Jews. 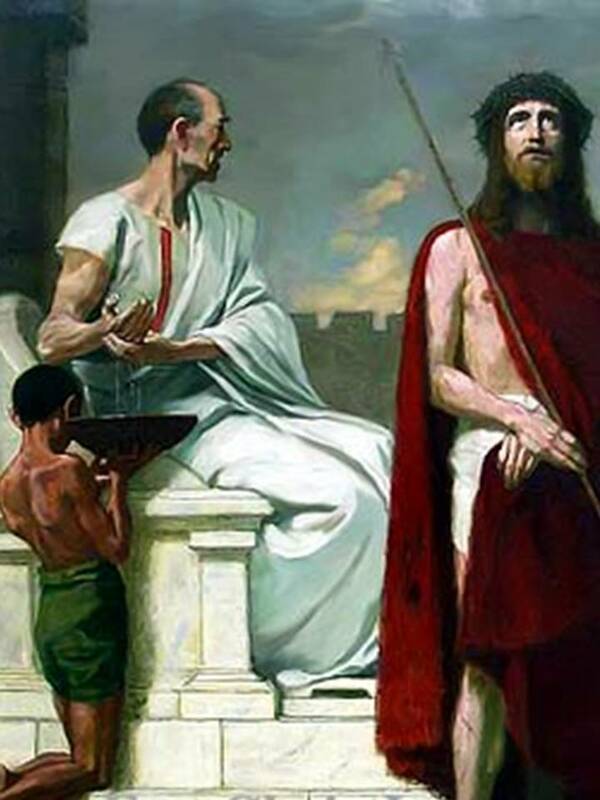 Pilate: I was appointed by Rome to oversee Jerusalem in 26 AD. My term lasted approximately 10 years. When you’re 1500 miles away from Caesar, you’re given some liberties, and I took them. Governors were appointed after all to make decisions, not get Rome’s permission on everything. We were usually sent out with a sufficient army to enforce the peace. But Caesar’s idea of sufficient was pretty optimistic. You had to be fast learner on the job, and, well, let’s just say you learned to be politically expedient. Pilate: Meaning your 1500 miles away from Rome’s support. You had to be willing to do what it takes to keep the peace. Interviewer: If you could do it over again would you change anything? Pilate: I think I initially underestimated the Jewish commitment when it was something they really wanted. Interviewer: Can you give an example of that? Pilate: I was serving in Caesarea, the city up on the coast of the Mediterranean. And I ordered some banners be taken into Jerusalem bearing Caesar’s image. It seemed like a good idea at the time, but the Jews went ballistic, something about violating their religious laws. Before I knew it a large constituency had gathered outside of my palace. It was my first lesson on Jewish resolve. They were willing to die rather than endure Caesar’s image in their city. Interviewer: And what did you learn from that? Pilate: I learned that you couldn’t cross the Jewish leaders. They had an amazing ability to manipulate the multitude. And once the multitude got out of control, everything was in jeopardy, including my position. Interviewer: Is there anything else you regretted? Pilate: [Pause] There was the matter of Jesus. Interviewer: Can you tell us about it? Pilate: What’s to tell? The Sanhedrin brought him to me at 6:00 AM. Because I was a Roman they wouldn’t even cross the threshold of my house. “Didn’t want to become impure,” they said. Hypocrites. Like you can keep your purity when you demand the execution of an innocent man? Interviewer: Did you believe Jesus was innocent? Pilate: Without question he was. I told them that seven times, but they wouldn’t listen. I had underestimated their resolve again. Then they brought up Caesar and they left me no choice. Interviewer: So what did you do? Pilate: I appealed to their compassion. I had him scourged – beaten ‘til the blood flowed freely. Stood Jesus before them, and said, “Behold the man.” “Crucify him,” they cried. So I appealed to their logic. I took the worst prisoner I could think of: Barabbas – his crimes were vile. He deserved to die. I stood the two of them side by side, and said you choose. The moment the words left my lips, I knew what was coming. “We choose Barabbas,” they said. What about Jesus? “Crucify him!” they cried. Interviewer: So you washed your hands of it? Pilate: Washed my hands? You ever kill an innocent man? You can claim you’re not responsible, but in your heart you know you are. Ironic. My wife was sleepless that first night—bad dreams, she said. She sleeps fine now. But I’ve been sleepless nearly every night since. You can wash the dirt off your hands, but you can’t wash the dirt off your past. This entry was posted in Easter Week.